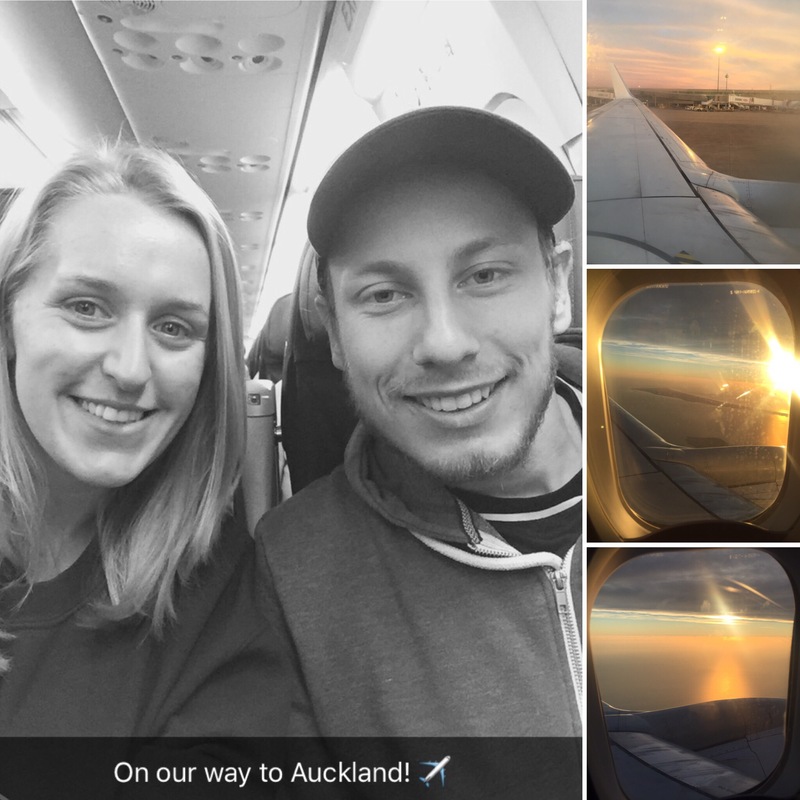 On Saturday 24th June 2017, myself and Niall got up at 2:30am to catch a bus to the airport for a 6:30am flight to Auckland. The reason we were going? 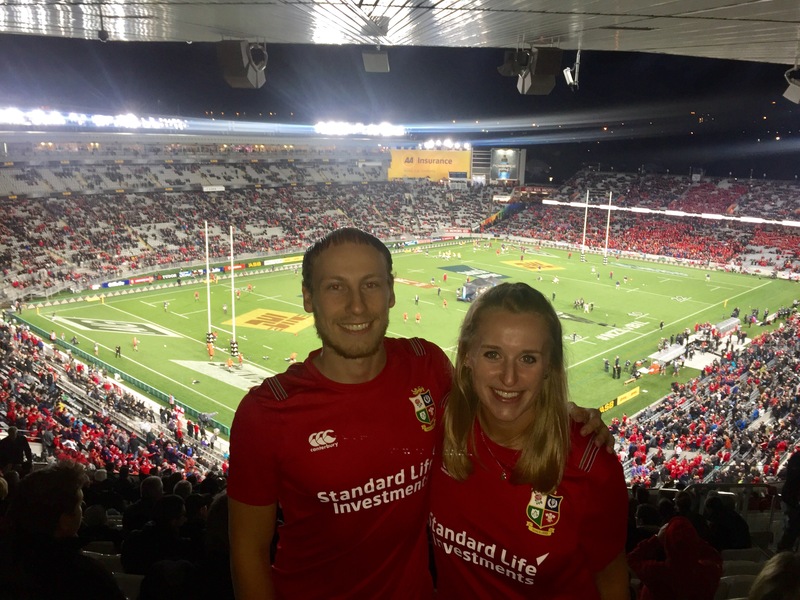 To see the first test match of the Lions Rugby Tour which hasn’t been held in New Zealand for 12 years! We had only managed to get tickets for the game a few weeks before, despite trying to get tickets since before we left the UK! Niall had got an email from the All Blacks saying tickets were still available and, with the help of Sophie’s New Zealand address (they were only meant to be for New Zealand residents), we had secured tickets for the first test and Niall had got himself, Sophie and her boyfriend Dan tickets for the second test match a week later in Wellington. We couldn’t believe we had been able to get tickets especially after trying to get them for so long and, really, giving up hope that we would be going! The flight was full of people heading over for the game. Red lions tops were scattered through the plane and the flight attendant at the end of the flight even made a “Go All Blacks!” remark targeted at a large group of lions fans who were sat at the back of the plane! Just incase you don’t know (very possible as my rugby knowledge was extremely limited until I came away) the Lions are a mix of rugby players from the England, Ireland, Wales and Scotland national teams. 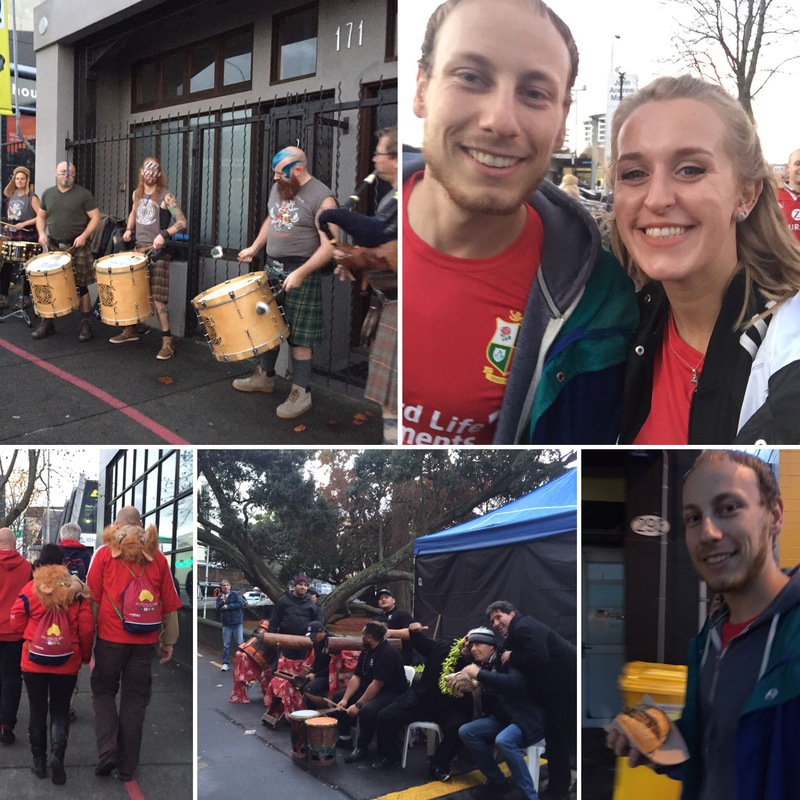 Every four years they come together and go to either New Zealand, South Africa or Australia and play the country’s local and national teams in a tour that I lasts around 5 weeks. This has been going on since 1888. This year was New Zealand’s turn and, seeing as the All Blacks are the best rugby team in the world, it was promising to be a great game. Niall also told me that, before this game, the All Blacks and the Lions had played each other 38 times and, of those 38 times the Lions had only won 9 times! After checking in and changing into our Lions tops (we had to go all out after all!) we headed to the fan zone. Here we were able to have a close up look at the trophy and other trophies that the All Blacks had won in the past (there were quite a few!). We then went for a drink in the giant bars they had set up and got to watch some of Fiji vs Scotland rugby game happening in Fiji at the time (Fiji won). It was incredible seeing the amount of red in the city. Wherever you looked there were red tops, hats, scarfs and coats – probably the most British people I have seen in one place since leaving the UK!! The atmosphere was great. 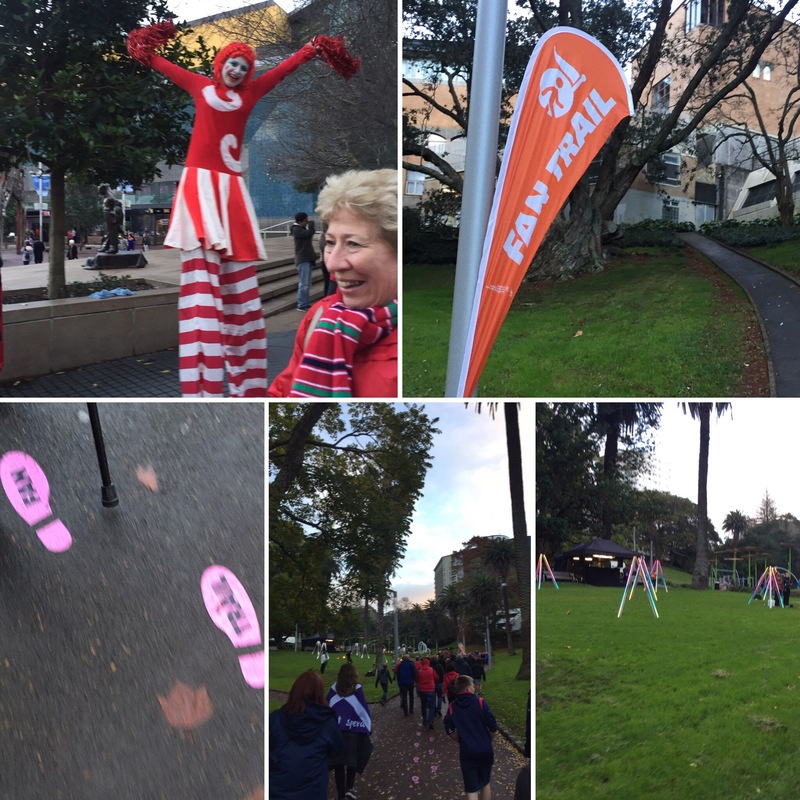 The walk from town to the stadium (Eden Park) was around a mile long and the whole way had been marked by pink feet with ‘fan trail’ written on them. It was great walking to the stadium because of the sheer number of people all walking along together. At different intervals along the way there were bands, bagpipes and even some fire dancers! Near the stadium there was even a food cart giving out free pulled-pork sliders which was great for Niall. We arrived in plenty of time for the game to start and got to have a wander around the stadium as well as see some of the players come out onto the ground for a warm up. Niall pointed out the famous players and some of the commentators we were near had also been some of the best rugby players of their day. It was cool to see the commentators setting up and the players rituals before the game with some zoning out and ignoring everyone to others giving hi-fives and getting photos. There was also entertainment on while we waited for he game to start like a dancing brass. And who ended their set with their own Haka! We went to our seats which were right on the top row in the corner of the stadium which actually meant we had an amazing view. 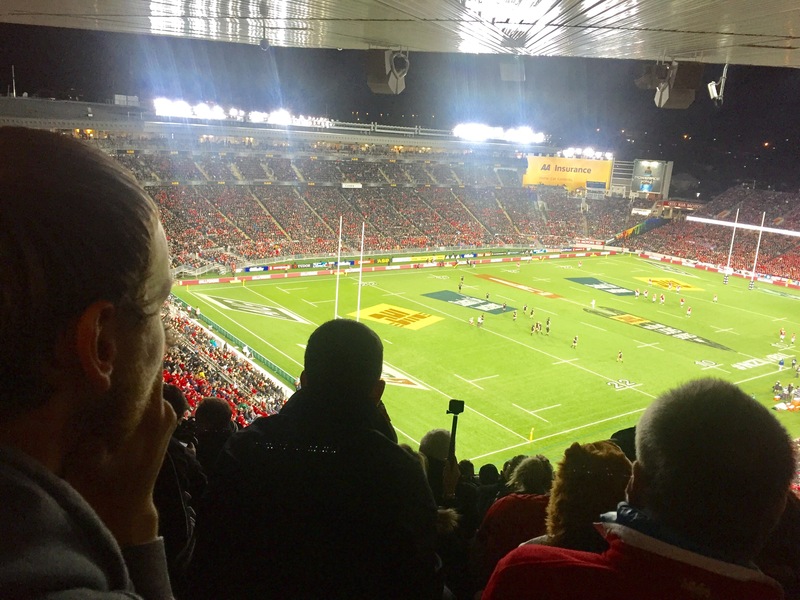 We could see the entire pitch from our seats and we’re surrounded by a mix of Lions and All Blacks fans (in case you didn’t know, football is pretty much the only sport that has to divide its fans by team). 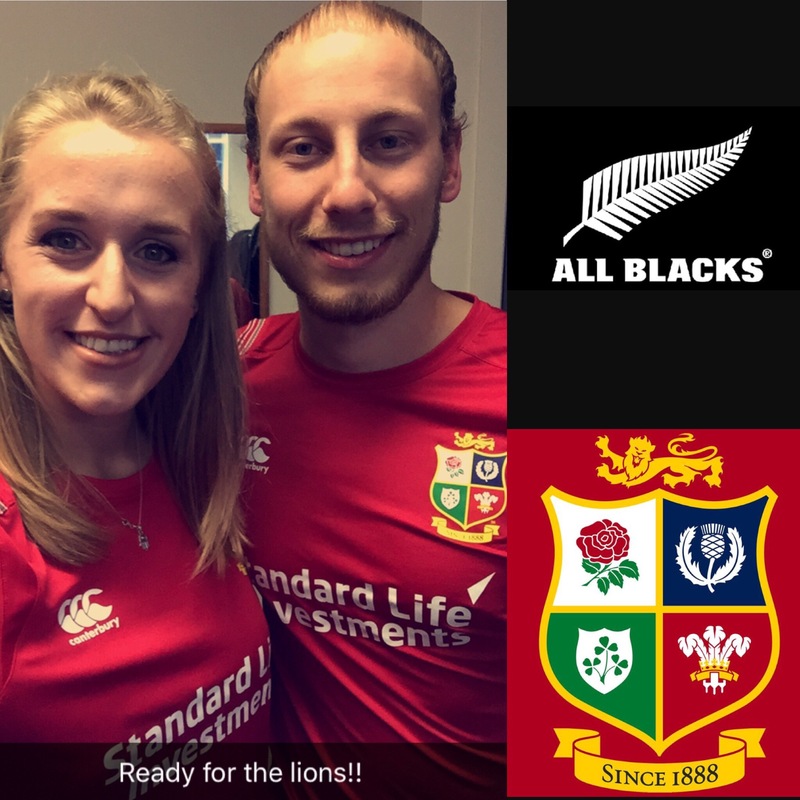 Niall had brought his team’s rugby training top and got a photo of that with the crowd and sent it to his rugby team back home – it was very common to see people in their local rugby colours over the lions tops or wearing their rugby team hat, ties or blazers which I really liked. It was definitely a more male crowd at the game which was particularly clear when going to the bathroom. One thing that made me laugh was that the men had to queue and the women didn’t – something I have never experienced in all the sporting and music events I have been to in my life! It was mad and was the only proof I needed that I was outnumbered at the event! When the players came out onto the pitch the roar of the crowd from the Lions was incredible. 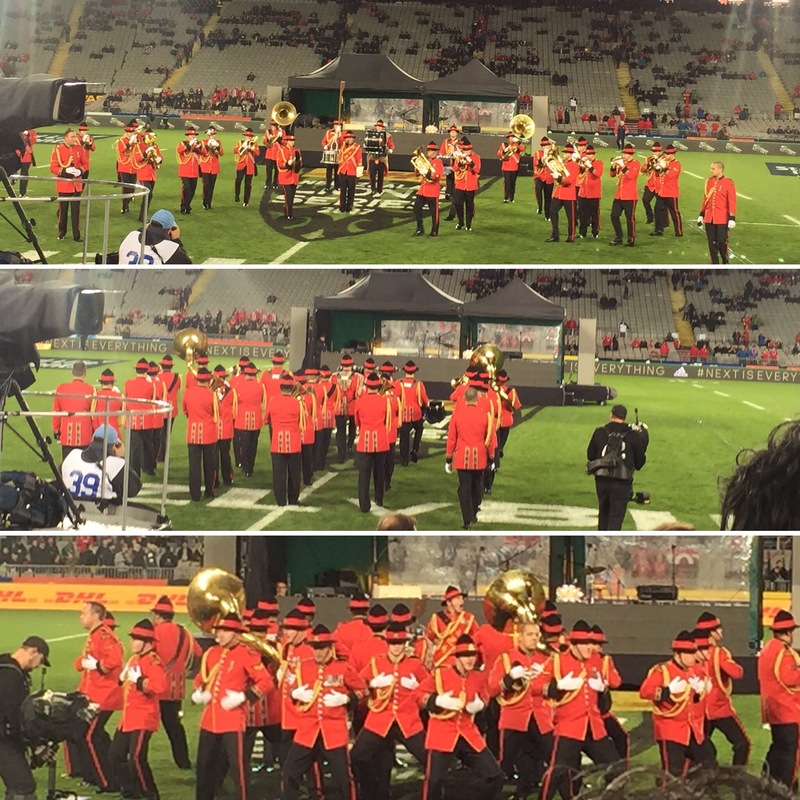 They had music playing when they came out but, of course, it was the All Blacks that got the big welcome onto the pitch with flame throwers and fireworks! 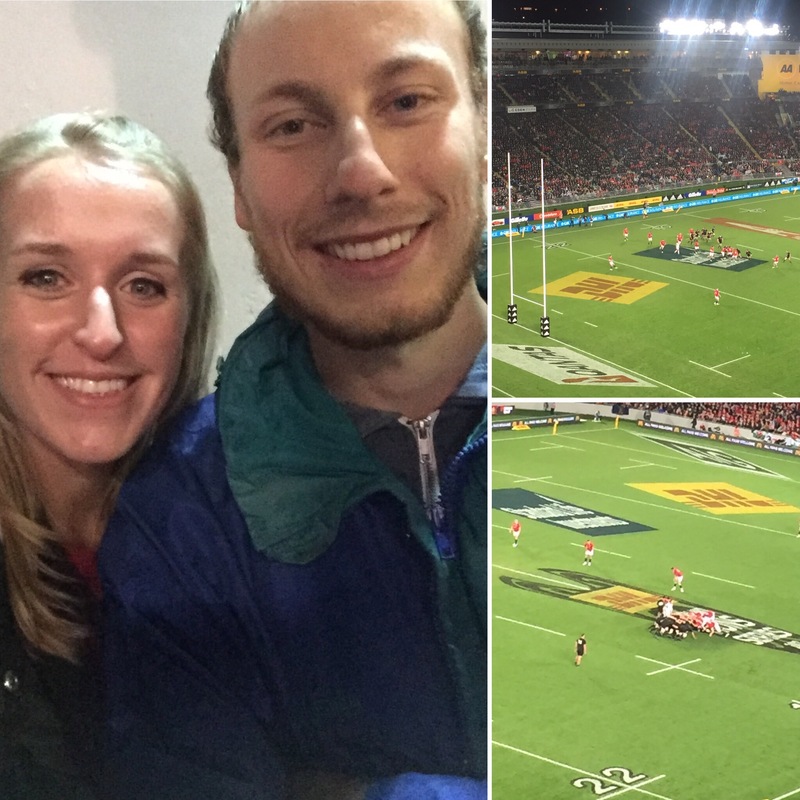 The crowd was so excited and I couldn’t believe that we had actually made it to the Lions Test Match! Of course, one of the best things about seeing the All Blacks play is that they do the Haka. This is famous all over the world and it was really amazing to see them do it at the game. 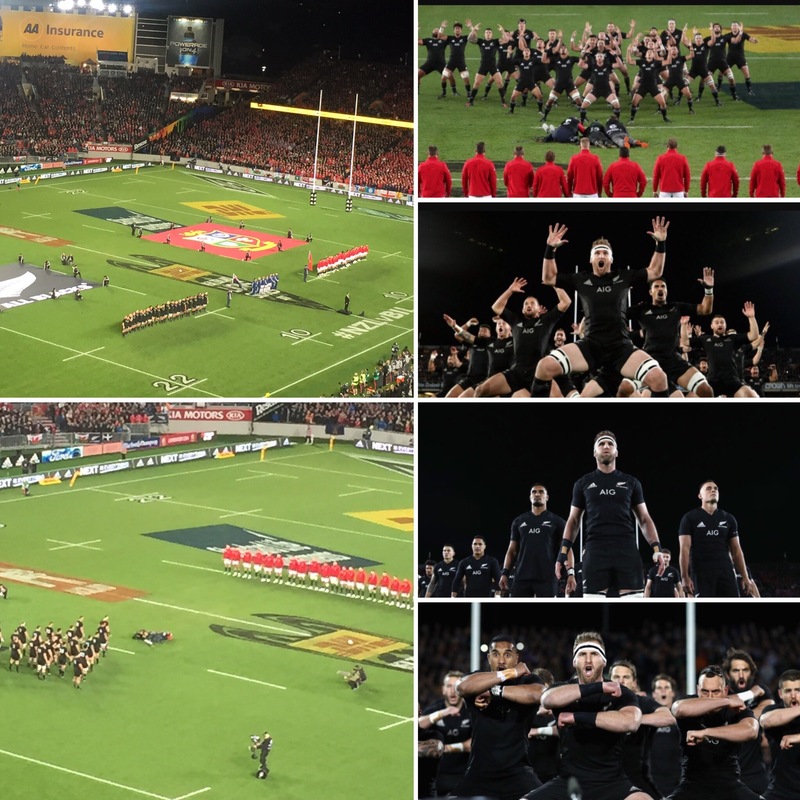 What is so incredible is that, when they go to start the Haka, the entire crowd goes silent and all that can be heard are the chants from the team echoing through the stadium. It was so good to see with a united red line of the Lions not reacting to a black triangle performing one of the most famous pre-game rituals in the world. The game began and it was the most exciting sports game I have ever been to! The Lions were trying to score at our end and, within the first minute or so, they nearly scored a try! We were going crazy and I still wish they had managed it as I imagine that would have been one of the fastest times to score a try in history (please bear in mind I’m saying all of this with no rugby knowledge). The game kept up that pace throughout the game which made it a fantastic game to watch. I had seen one rugby game in the past whilst we had been in New Zealand and had seen rugby league games since which had helped me get a better handle on what was going on (yes, I know that rugby league is very different to union, I just meant it helped me to get used to following the game better). 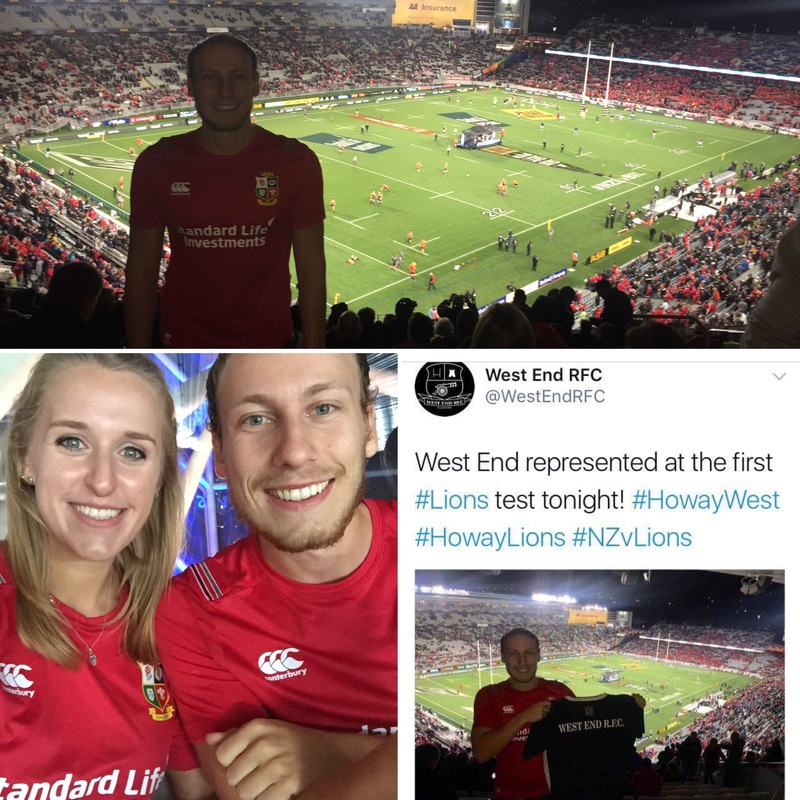 We were also lucky enough to see an incredible try from the Lions which had us all on our feet cheering and jumping up and down. It had come out of nowhere as the Lions ran nearly the whole length of the pitch to score and we couldn’t believe it! Niall said it was one of the best tries he’d seen and that it was one of the best tries the Lions have ever scored so I was so happy we had been there to see it, and at our end for the pitch too! The second half started with the same tempo and the All Blacks were only leading 13-8 so it was still all to play for. 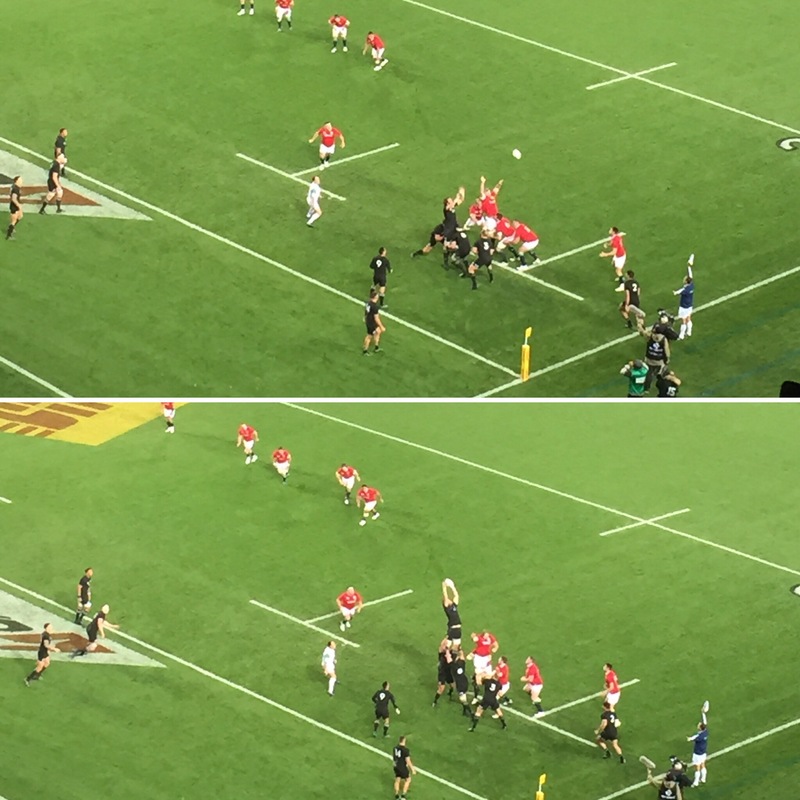 Around an hour in, the All Blacks scored a try that caused a lot of confusion as it nearly got cancelled and then, last minute, the referee chose to count the try after all. 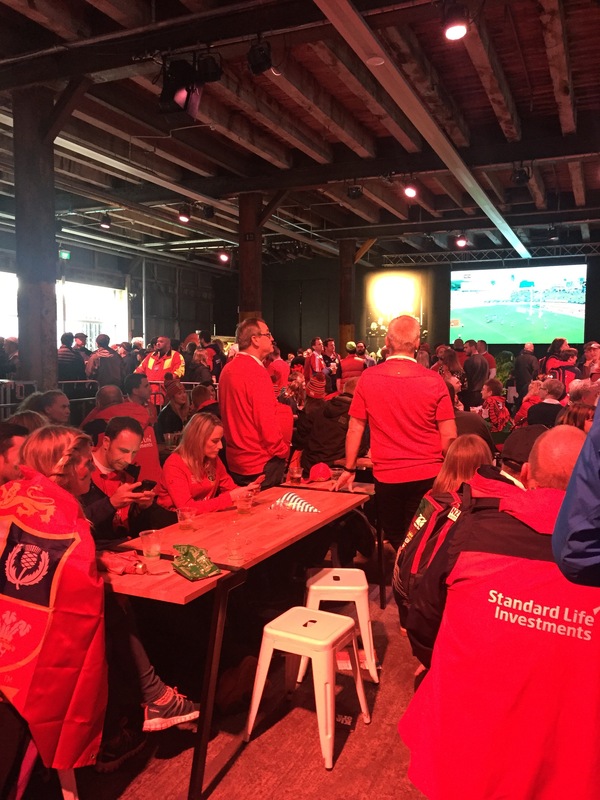 We didn’t really get why and it took a while to work out what was going on but it was clear that it knocked the Lions and in the last 20 minutes the All Blacks increased their lead up to 30 points to 8. 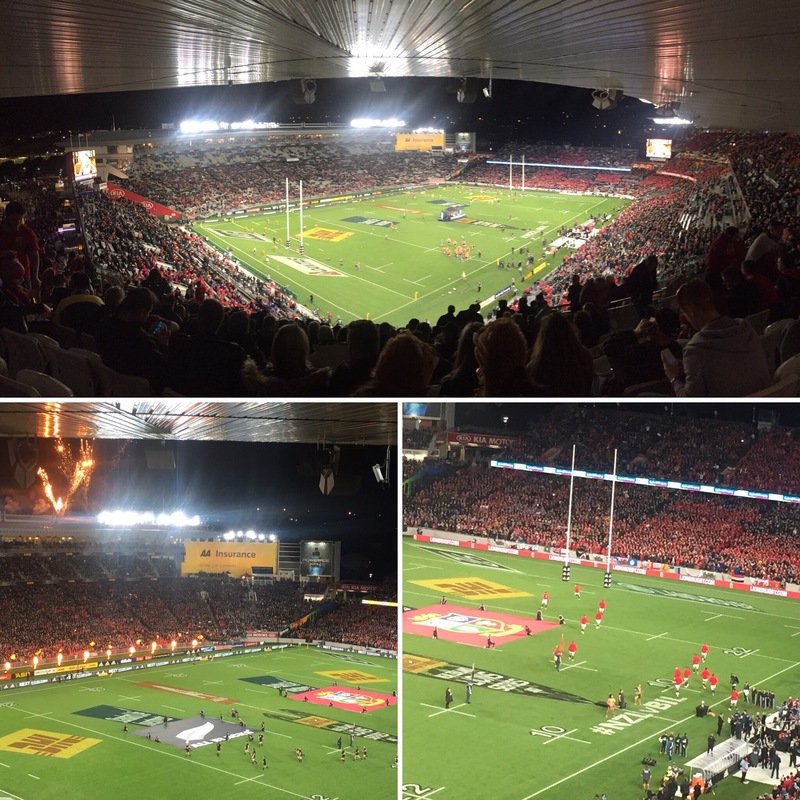 The game ended with a last minute try from the Lions making the score 30-15 to the All Blacks. We left the stadium with the 48,141 other people who had been there and headed into town for a drink. 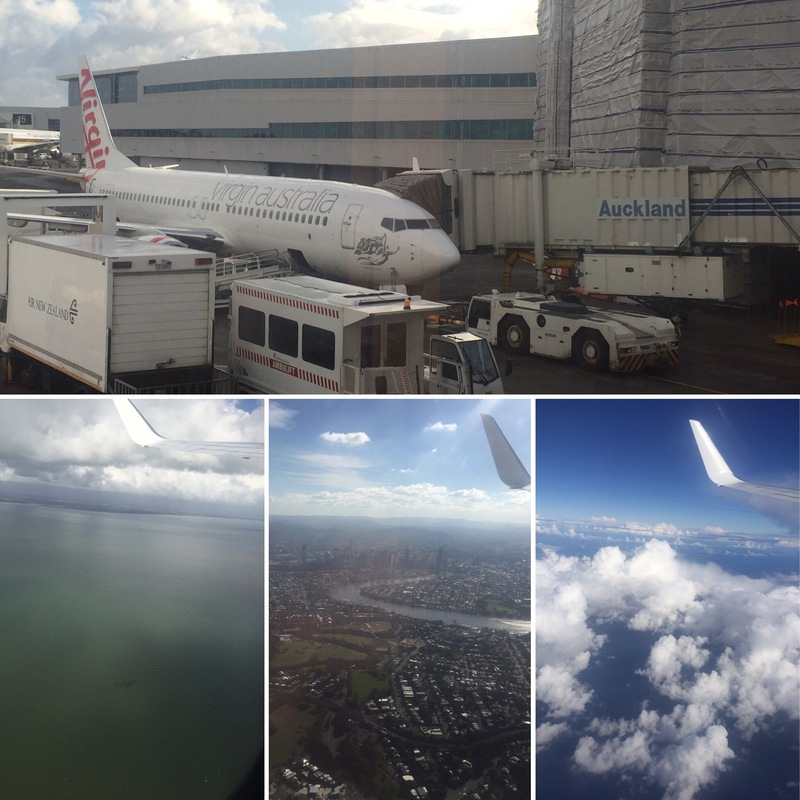 I was only in Auckland for 24 hours before going back to Brisbane but it was worth it! 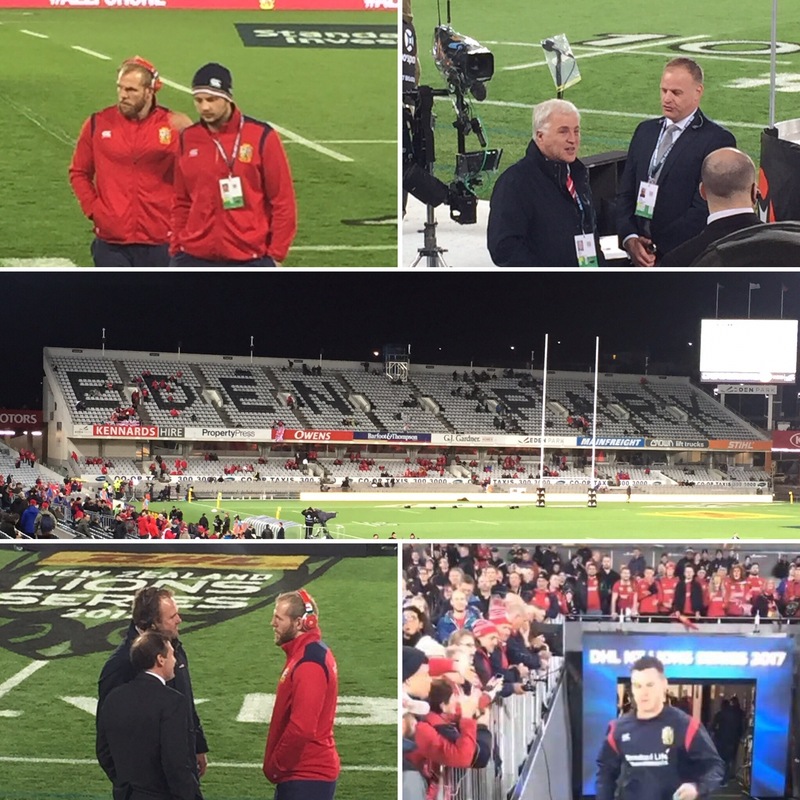 Niall stayed for another week to enjoy more of the Lions Tour and see the second test match. We both had the best day going to the match and we so glad it had been such an exciting game. Niall told me that the first hour of rugby was probably some of the best we’d ever get to see and it made me even happier that we had managed to get tickets to go! The atmosphere was incredible and it’s a rugby match I’ll never forget.